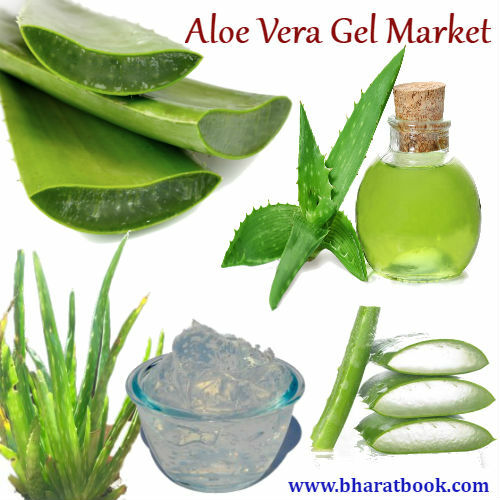 Bharat Book Bureau Provides the Trending Market Research Report on "Aloe Vera Gel Market: Global Industry Trends, Share, Size, Growth, Opportunity and Forecast 2018-2023" under Consumer Goods Category. The report offers a collection of superior market research, market analysis, competitive intelligence and industry reports. Aloe Vera is widely used for its healing and restorative properties. It belongs to the liliacea family and has thick green leaves which contain gel and latex. The gel consists primarily of water and the rest includes various vitamins, amino acids, enzymes, hormones, minerals and sugars, most of which are found in the human body. Aloe Vera gel is widely used in the food industry, cosmetic and toiletries industry, and the pharmaceutical industry. The global aloe vera gel market was worth US$ 507.2 Million in 2017, growing at a CAGR of around 11% during 2010-2017. The market has been growing steadily over the last decade driven by varied and increasing usage of Aloe Vera gel in food, health care and cosmetic industries. “Aloe Vera Gel Market: Global Industry Trends, Share, Size, Growth, Opportunity and Forecast 2018-2023” provides a comprehensive analyses of the global Aloe Vera gel market. The study segments the market on the basis of three key application areas of Aloe Vera gel in the cosmetics, food, and healthcare industries. The healthcare and cosmetics sectors are currently the two biggest drivers of Aloe Vera gel consumption. Region-wise, Thailand was the biggest producer of Aloe Vera gel accounting for around a third of the total global production. Other leading producers in the North and South American region include Mexico, Dominican Republic, United States and Costa Rica. The report also analyses some of the key players of the Aloe Vera gel market. Forever Living Products is currently the largest producer of Aloe Vera products in the world. Other major players include Herbalife (USA), Aloecorp (China), Aloe Laboratories (USA) and Aloe Vera Australia (Australia). The report gives a detailed roadmap for starting an Aloe Vera gel manufacturing plant. The study, done by one of the leading research and advisory firms, covers all the requisite aspects of the global Aloe Vera gel market. This ranges from a comprehensive view of the market to minute details of the industry performance, processing & manufacturing requirements, project cost, project funding, project economics, expected returns on investment, profit margins, etc. This report is a must-read for entrepreneurs, investors, researchers, consultants, business strategists, and all those who are planning to foray into the Aloe Vera gel market in any manner. * How has the aloe vera market performed so far and how will it perform in the coming years? * What are the key regional markets in the global aloe vera industry? * Which are the key application areas for aloe vera gel? * What are the price trends of aloe vera? * What are the various stages in the value chain of the aloe vera gel industry? * What are the key driving factors and challenges in the aloe vera gel industry? * What is the structure of the aloe vera gel industry and who are the key players? * What is the degree of competition in the aloe vera gel industry? * What are the profit margins in the aloe vera gel industry? * What are the key requirements for setting up an aloe vera gel manufacturing plant? * How is aloe vera gel manufactured? * What are the various unit operations involved in an aloe vera gel plant? * What is the total size of land required for setting up an aloe vera gel plant? * What are the machinery requirements for setting up an aloe vera gel plant? * What are the raw material requirements for setting up an aloe vera gel plant? * What are the packaging requirements for aloe vera gel? * What are the transportation requirements for aloe vera gel? * What are the utility requirements for setting up an aloe vera gel plant? * What are the manpower requirements for setting up an aloe vera gel plant? * What are the infrastructure costs for setting up an aloe vera gel plant? * What are the capital costs for setting up an aloe vera gel plant? * What are the operating costs for setting up an aloe vera gel plant? * What will be the income and expenditures for an aloe vera gel plant? * What is the time required to break-even?